What i saw the other day in my blog, weird visitors number huh? I am smoking Mac Baren Mixture Aromatic. Not far from finishing this bowl of D&R Raccoon’s Accent in a smooth medium bend straight grain 2000 Winslow C silver spigot wide top Dublin with a canted plateau and black acrylic stem. Now smoking 12 year old Penzance in a 1990s smooth Peterson Captain Pete XL80 bulldog with a black vulcanite stem and p-lip. Working and listening to The Jack Benny Program. C&D Burley Flake #3 aged 3 years. This is a Burley in my opinion for the experienced pipe smoker. Has a tendency to get stronger mid way through and can bite if smoked to fast. Pipe of choice: Aldo Velani full rusticated billiard pipe with a wide stem. Have not smoked this pipe in a few years, a bit heavy as I remember. JIMINKS, your opinion on the tobacco???? Thanks, well appreciated. Paul’s Pipe Shop Arrowhead in a 1976 black rough carved Pioneer Meerschaum Oom Paul with a pearl brown acrylic stem. It's only 4 stars if you like a very strong burley blend. It could knock you off your feet if you're a fast puffer, and you risk it burning a little harsh and ashy if you do. It won't hurt to have a little food in your stomach. Do all of that, and you'll be rewarded with a powerhouse burley with all the burley notes you've come to expect (a mild sharpness, lots of earth and nuttiness and some molasses), plus a light natural Virginia grass and citrusy sweetness to take the edge off. I think there's more than just a "dash of perique" in this blend, but it really helps make this a smoke worth having. The perique adds a decent spice and raisin hit. I don't recommend this to anyone who's inexperienced in pipe smoking. But if you've been around burleys for a while and need the big nic-hit, this could be your blend. Burns cool and clean at slightly less than a moderate pace, and needs a few relights, but the flavor remains consistent to the finish. Leaves little moisture in the bowl. Won't bite. Those folks at Just For Him are a great bunch! Good stuff you got there! Thanks JimInks, you hit it dead on! I enjoyed it and have for a while, but it's a blend for an experienced pipe smoker or a novice that needs to sip this blend. It's worth it if you pace yourself. Alex, nice pictures, thanks for sharing. Glad you get to relax after a hard day working!! Forgot to mention: I received 4 oz. of Ruins of Isengard as a gift last Father's Day, superb Latakia blend. Needs a bit of drying time. Worth the trip!! My Budd III in one of my MM Legend pipes. Ted im happy to read that you are a cob snob as well. Alex, I enjoy a good cob, one that can last a while without burning thru the side walls...lol. I think next year I might make a few, haven't in a while but not that difficult. I do put a piece of hardwood on the bottom inside the chamber, makes all the difference. Enjoy your blend. The shame of it, maybe no more of Just For Him blends after May of 2018, lets see if the Donald steps in????? Dunhill Elizabethan in a 2001 smooth full bend St. Patrick's Day Peterson 03 with a black vulcanite fish tail stem. Ice water and bergs is my evening drink. Going to be busy, so I'm listing this a little early: early 2000s Charatan Mild Flake in a much cherished smooth straight grain three quarter bend 1979 Becker M 4 heart brandy with a black acrylic stem. 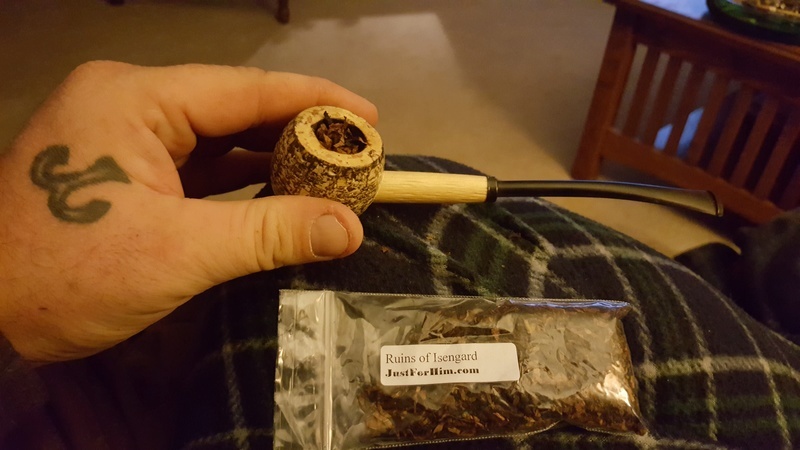 BBQ Blend in an Osage Orange warden, 12 inch stem. Triple Play in a Chris Morgan Bones straight apple. Just finished smoking MacBaren Symphony in a slight bent black pattern etched 1979 Lorenzo Lorsan Sigma tilted top with a gray swirl colored stem. Dunhill Elizabethan Match in a 1982 smooth straight Dunhill Root Briar 31051 Dublin with a black vulcanite stem. 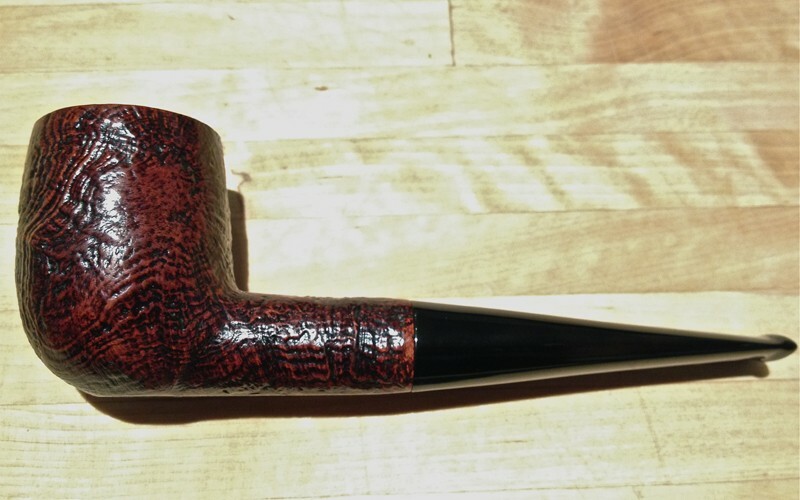 P&W Nut Brown Burley in a 1984 medium bend black grain etched Savinelli Non Pareil 9310 poker with a horn ferrule and a black vulcanite stem. Listing this early: Drucquer & Sons Prince’s Blend in a 1977 straight black rusticated Sir Brent billiard with a silver band repair and a brown pearl grey acrylic stem. 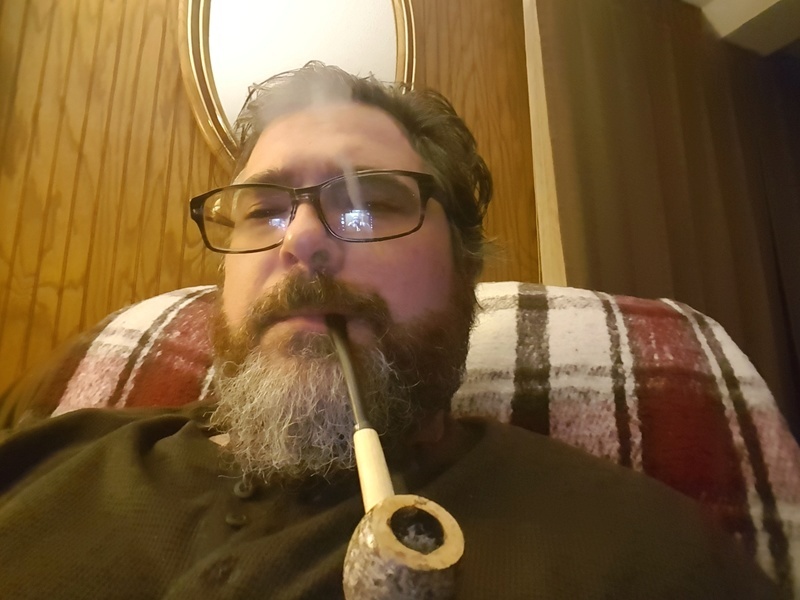 A couple minutes away from smoking 1970s Edgeworth Aromatic (Red) in a light brown 1979 rusticated medium bend Italian Sir Jeffrey Dublin sitter with a flared top and yellow stem.